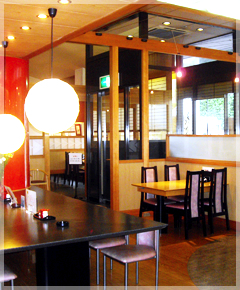 Hanagokoro’s resutaurant offers a Kyoto-style and vegetarian cuisine with mainly Japanese dishes for all guests, who enjoy a casual and relaxing atmosphere. 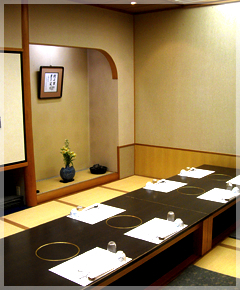 On the second floor we also have a banquet hall for wedding receptions, welcome parties, as well as for holding Maiko-shows. 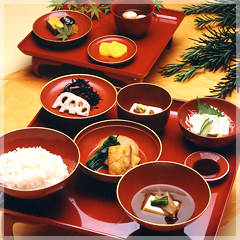 For guests coming as a group we also offer the possibility to have a meal at the nearby temple. 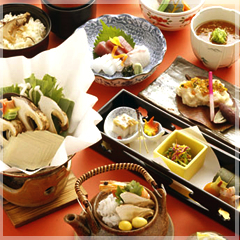 For smaller and bigger parties and events we serve drinks and prepare simple Kyoto-style meals with seasonal ingredients that include table and bowl dishes, noodles, and a vegetarian cuisine. 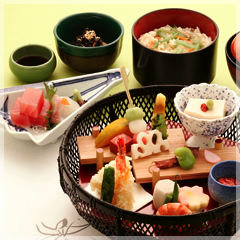 Along the standard drinking menu including coffee and tea, we offer Japanese sweets. 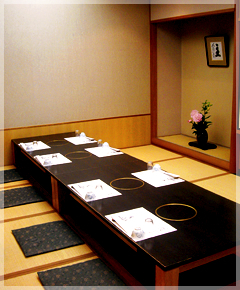 When you are in Kyoto for sightseeing or stay at the Hanazono Kaikan Hotel, please come to enjoy our meals. There is Hanagokoro in Daihonzan Myoushinji Temple Nansoumon-Gate Hanazono Kaikan Hotel. The “Daihon-zan Myoushinji” is the headquarter of the Rinzaisyu Myoushinji Buddhist sect. This Buddhist sect consists of about 3400 members belong to the Myoushinji group. Standing at the “Nansoumon Gate”,you have a magnificent view on the temple facilities of the Buddhist sect. The Ryouanji temple’s main attraction is the “Ryouanji Stone Garden”, which is a Japanese garden composed entirely of rocks and sand, following the Zen Philosophy in its layout. The design of the garden is set in a special way:　There are 15 main rocks, which are put together in a way that from whichever point you look at the garden, you can only see 14 rocks. One rock always remains unseen. However, there is a spot in the garden, from where you can actually see all 15 rocks. Let’s try to find the spot. This temple is a piece of architecture that represents the Kitayama culture of the whole Muromachi Era.Since 1994 the Kinkakuji Temple belongs to Kyoto’s world cultural heritage properties. The temple facility as a whole is called “Kinkakuji”, where as the actual golden architecture is named “Kinkaku”. Together with the “Ginkaku” and the “Hiryukaku”Temples,the three pieces of architecture are called the “Kyo no san kaku”(means three kaku of Kyoto). The Nijojo Castle symbolizes the place of the beginning and the end of the Edo Era. Its famous Japanese garden represents the Momoyama culture and is a typical design of Ensyu Kobori. 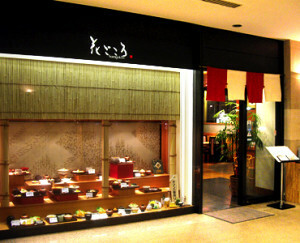 In 1939 this national treasure became the most famous sightseeing spot in Kyoto.